South Korean sport utility vehicle maker SsangYong Motor has been manufacturing luxury automobiles and specialist vehicles for more than five decades. By centering their efforts exclusively on 4x4 vehicles, SsangYong has won a reputation for impressive all-terrain vehicles and MPVs with the focus on real on-road and off-road ability, best-in-class power and build quality. The company's notable fifty-year heritage in the 4x4 sector and the constant aim to develop the best-in-class 4x4 models, have resulted in production of supremely capable vehicles loaded with the latest technology. Some models that have been produced by the SsangYong include the Kyron, Rodius, and the Rexton. 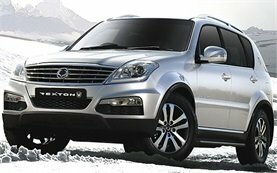 Fine car hire options of the brand for Bulgaria are the Rexton and Kyron. Rexton's modern and refined styling coupled with technological advance and a real off road capability continues to win over more motorists and car hire customers in Bulgaria. The Kyron, a competent and practical SUV, offers more than the average compact 4x4 and is certainly a great value for money vehicle for your car hire in Bulgaria.